I am pleased to report that there is a new Firebird in the nest! 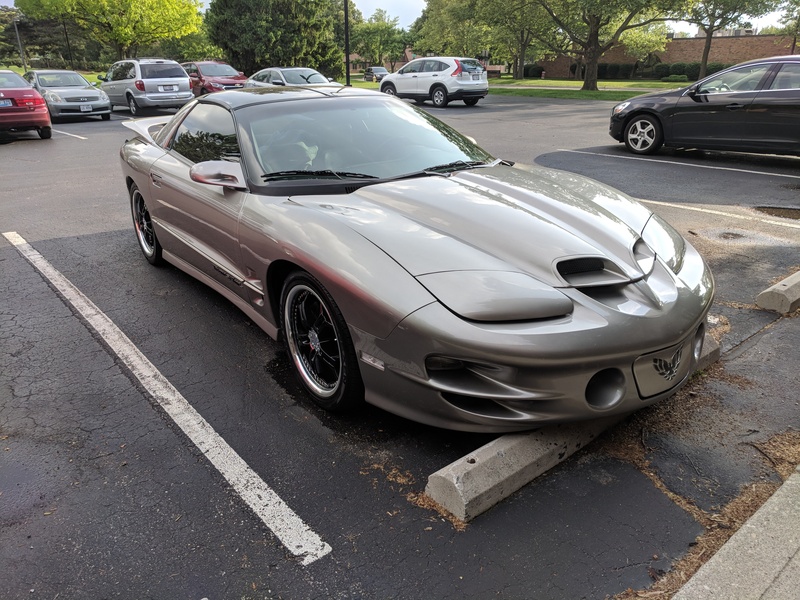 Last summer (2018) I acquired a 2000 Trans Am. It is a regular (not WS6) T-top 2000 Trans Am with the 6 speed manual. The color is “Pewter Metallic”, or another word for gray with a gold tint. The car has been modified but only enough to maintain a factory look, which I like. A little backstory, my current 1981 Trans Am is awesome, but it lacks a couple amenities that I would like in a sporty car, such as air conditioning. I wanted something newer in the stable that I could put my wife and kids in it and still feel safe with airbags and modern technology. Most importantly though, I have had manual transmission withdraw and saw an opportunity to buy a 2015 or 2016 Camaro as a way to fill that void. After test driving a 2015 SS2 and a 2016 Camaro SS2 and feeling like the car didn’t seem like it was designed to be driven with a manual, I paused my search and accepted defeat. Then later last summer my buddy Joel sent me a listing to this 2000 Trans Am. I decided to take a look, it couldn’t hurt. After a test drive and details from the previous owner, I decided I had to have it. The best part, I was able to buy it out right rather than finance the car. The only downfall with this, I would not have any funds to drop into the 1981 Trans Am, but that was ok, I had a busy year in 2018 and for once, I was enjoying two cars rather than fixing 1. 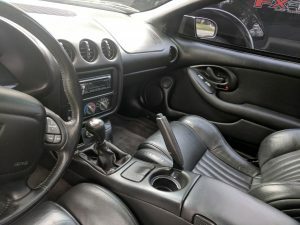 First impressions of a used mildly modified 73k miles 2000 Trans Am: This car is worth every penny! The tires do not grip as well as they may have many years ago, and there is some vibration in the front during braking (slightly warped rotoers perhaps) but otherwise it performs like a new car. The ride is a bit harsh, though I do not think it is bad though I have previously owned a Honda Civic Si, and thought that had a good ride even though I have been told it was a bit rough. Power wise, this LS1 can keep up with the best of them and backed by the 6 speed T56 Tremec with 3.42 rear gears and 26″ diameter tires, it is a lot of fun to row through the gears. As far as smiles per gallon, this car delivers a lot of them. These cars are 1/4th if not more the price of a comparable (although not quite as much tech) 2014+ Camaro SS with leather. Of course if you have a 2015 Camaro SS2 you may have another 100-150hp, but the fun factor is nearly the same if not better. The 2015 and 2016 Camaros (two different generations) I test drove just didn’t have the same “for the driver” feel that this 2000 Trans Am had. For example, the clutch pedal in the 2016 and more so in the 2015 Camaro felt out of place, like an after-thought by the designers. Another example is the sunroof, it wasn’t above my head in the 2015 Camaro, it was further back and felt out of place from inside the car. This 2000 Trams Am, the clutch is right where you want it. Don’t get me wrong I like the new Camaro’s, but the last 2 generations seem to have focused on the performance and the beauty on the outside of the car leaving the inside not very well thought out for the driver or passengers. The previous owner made a few modifications including a SLP Performance cold air intake, Ram Air Hood (WS6 factory style), Loudmouth cat back exhaust system with quad tips , B&M Pro Ripper shifter with a factory Hurst shift handle, 18″ Helo rims with 245/40 18 Nexen tires, and H&R 2 inch lowering springs. The owner has also installed a subwoofer with amp and a Kenwood CD/mp3 player with bluetooth. The previous owner did an excellent job of maintaining the car. All of the accessories work, air conditioning blows cold, steering is tight and crisp, seats have light wear but no tears or rips, and the dash is not cracked. 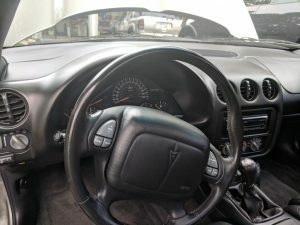 The only issue with the interior is with the door panel on the drivers side, it is cracked at the top which appears to be a common issue with the 98-2002 Firebirds due to how they assemble the panels. Otherwise, the car is good to go. There are only two things from above I am not happy about. The Loudmouth exhaust and the B&N Pro ripper shifter. The Exhaust is quite loud when you are on it and when you’re just cruising around the system is still quite loud. From what I can tell it is nothing but pipes, the system has no muffler or resonator after the catalytic converter. The B&M shifter also has problems, it does not fall straight to center like I am used to in other 6 speeds that I have driven. I am not sure how to fix this problem with the ripper, but on a Hurst there are springs with washers that adjust this so the shifter aligns with 3rd and 4th gears. This shifter may have been a great shifter years ago but its age shows today. 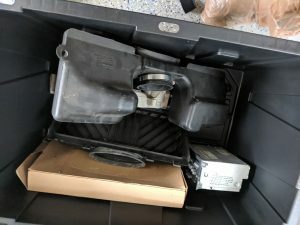 As far as all the original parts go, the seller gave me everything he had. 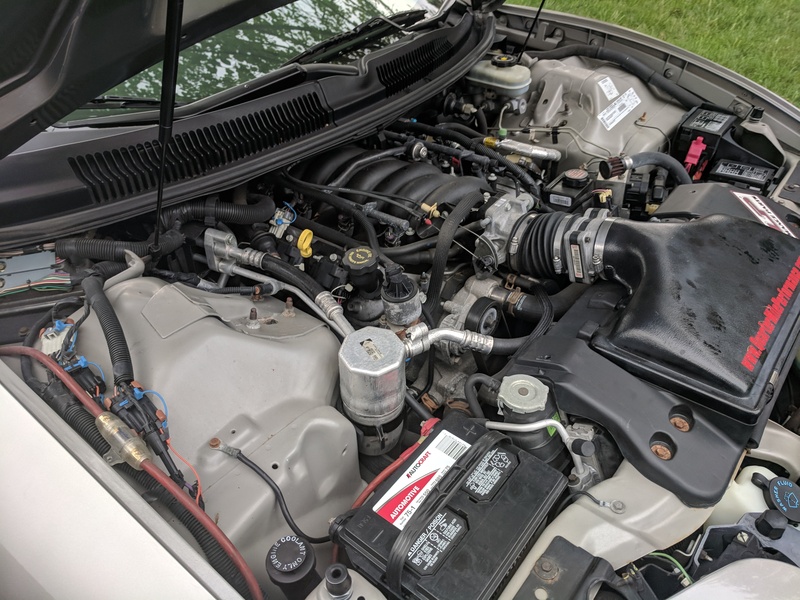 Though he did not keep the original exhaust or the hood, the seller did have the original radio, speakers, springs, rims with tires, factory intake duct work, and shifter. I did not change much with this car. The first weeks of owning the car I quickly grew annoyed by the required skip shifting during light or moderate driving. By week 3 I went to Jegs and got a skip-shift eliminator kit. If you are not familiar, the factory T56 transmission forces you to shift from 1st to 4th under light and normal driving. The only time it lets you go into 2nd is when you shift early or you are under heavy throttle. for 2019, I am not planning much other than to enjoy the car. I think I may purchase a MGW shifter to replace the B&M Pro Ripper as well as flush the brake and clutch fluid. The Nexen are definitely getting replaced. The current tires are M+S all seasonal tires and they are now in their 11th year of age. Though the tires have plenty of tread and I see no sign of cracks or damage, I think they have dried out and have lost their sticky-ness on the road, I can too easily let the wheels loose. For a car with 3.42 rear end ratio, I shouldn’t be doing a burn out with only a 3,000 rpm starts. Maybe a wheel chirp but these tires will let loose way too easily and I am sure it is due to their age. 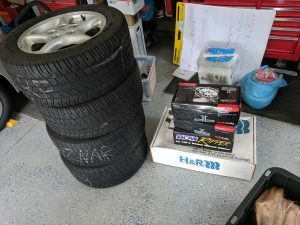 I have Nitto NT 555 255/50 17″ wheels on my 81 Trans Am and found they grab well. At first I was disappointed with the Nitto tires as it became much harder to do a burn out in the 81, but that is exactly what I need for this 2000.